Over the last decade, federal regulatory agencies finalized more than 37,000 regulations, yet 92 percent of rules escaped review by the Office of Information and Regulatory Affairs (OIRA), a small office tasked with reviewing significant regulatory actions promulgated by such agencies. Of the roughly 3,000 rules OIRA did review, only 116 have estimates of both benefits and costs appearing in OIRA’s annual report. Relative to the cost of many of these regulations, expecting agencies to analyze benefits and costs before issuing a rule is a fairly low bar to set. 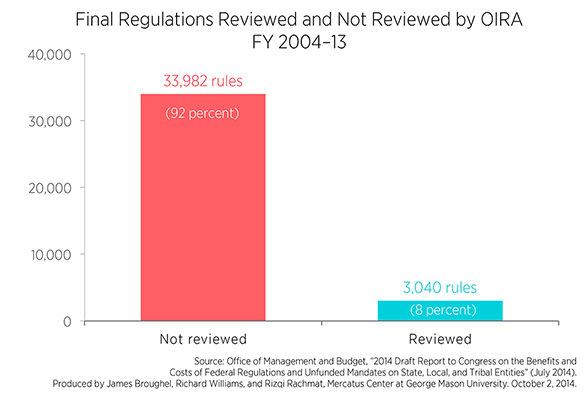 The numbers suggest that the analysis of rules reviewed by OIRA is severely lacking in most cases. Of roughly 3,600 rules finalized last fiscal year, only seven had estimates of both benefits and costs appearing in OIRA’s report.